Joystick 2 Mouse is a small utility which provides mouse functionality to connected joysticks and joypads. Using the program is a simple task but a few setup options are required before you turn your joystick in to a mouse-like controller. You can also load different included profiles. Namely, you should map different functions to your controller axis. Version 3.20.5 is a freeware program which does not have restrictions and it's free so it doesn't cost anything. 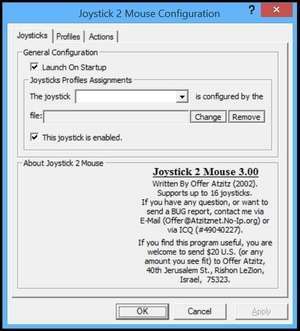 For security reasons, you should also check out the Joystick 2 Mouse download at LO4D.com which includes virus and malware tests. Additional screenshots of this application download may be available, too.